LinkStation Pro Quad LS-QVL RAID network storage offers instant storage expansion and file access on your home network and over the Internet. Twices as fast as a standard NAS, LS-QVL features a high-speed, 1.6 GHz processor for maximum transfer speeds up to 71.9 MB/s. Plug it into any Ethernet port or into the back of your wireless router and access it on any networked computer in your house. While on the go, use Buffalo’s free WebAccess service for remote access to your files over the Internet from any standard Web browser. You can download the free WebAccess i Apps from the iTunes® store to access and share files from your iPhone®, iPod touch® and iPad®. Included NovaBACKUP® Professional software for Windows® and Time Machine® support provide a whole home backup solution for every PC and Mac® on your network. 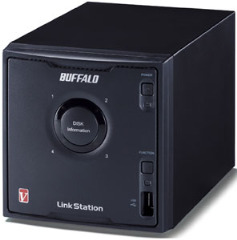 LinkStation Pro Quad makes central storage and backup easy. WATASHI 4CH # WRC124 promotion pack. PeopleFu # 907SN (16mm) plus a leg.